This is an early Roman bronze finger ring, dating to the 1st - 4th century A.D. The ring has been made from a single length of low diameter wire. The hoop consists of a single strand, to form the shoulders the wire has been wound into tight spirals, while the bezel comprises a pair of interlaced loops. The rings is bent, corroded and showing its great age. 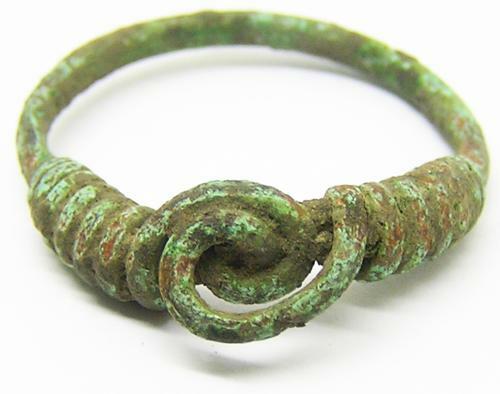 A similar ring was found in excavations in Colchester (see Crummy 1983: p. 47/fig. 50, no. 1756), in a layer dating from AD c. 49 and c. 55. Crummy suggests that the style of the Colchester example exhibits a continuation of native, pre-Roman traits. However, several twisted wire rings were also found at Wanborough, Wiltshire (Anderson et al. 2001: 92), and the cited parallels for these rings range widely in date, from 2nd to 4th century. A broad date range is therefore suggested for this example. See also BH-1237F3 for discussion. DATE: c. 1st - 4th century A.D.